Irish clover ornament features a superimposed leprechaun's hat that is filled with shamrocks. This Irish ornament is made by Kurt S. Adler. 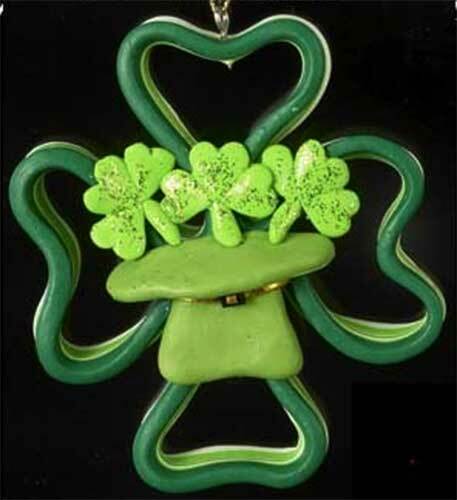 This Irish ornament is a four leaf clover that is enhanced with shamrocks popping out of a leprechaun's hat. The clover ornament is made of claydough and measures 3 1/2" wide x 3 1/2" tall; it is ready to hang on your Christmas tree with the included gold cord.